Most analysts wait for prices to fall 20% before declaring a bear market. That’s a widely accepted, but deeply flawed, approach. That rule ignores a 15% decline that unfolds over a year, for example. That 15% loss isn’t a bear market to most investors, but they’d probably feel the same degree of despair in both markets. The chart below shows an adaptive model to define bear markets. 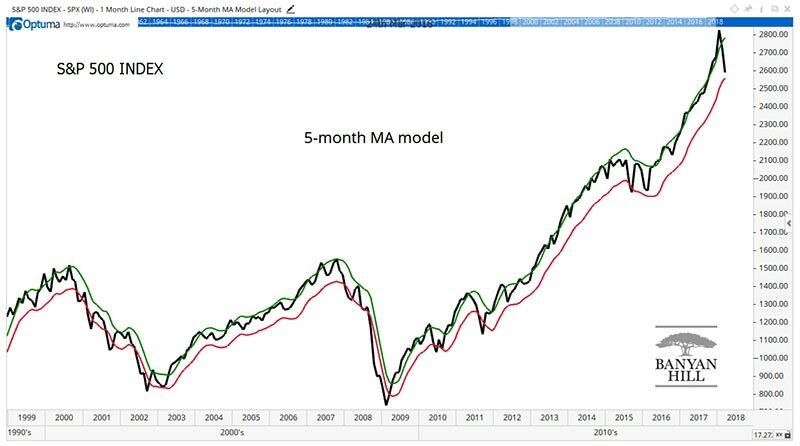 It starts with a five-month moving average (MA). When prices fall 4.8% below the MA, a deep decline usually begins. This model sometimes fails. Prices occasionally turn up after breaking below the lower line in the chart. But investors quickly get a new buy signal when prices rally 3.6% above the MA. When using MAs, many traders use simply the MA rather than bands around the MA like this model does. MA systems frustrate traders because there are too many signals and most signals are wrong. Bands like those in the chart reduce the impact of this problem. Another problem with MAs is that markets rally off bottoms quickly. Most trading systems with MAs miss a large gain when the bear market ends. Asymmetric band values like we use here reduce the impact of this problem. Now, before revealing the precise level that the next bear market starts at, I want to remind you that a break of the lower band isn’t a signal to move to 100% cash. Conservative investors might want to do that. But there’s always a bull market somewhere. Even in the worst market crashes, a few stocks always go up. Maintaining some exposure to the stock market is usually best. It might result in losses on individual trades, but a large cash position protects the portfolio. Finally, the number to watch is 2,556 in the S&P 500 Index. A close below that price will be a bear market signal. And that is the time to trade defensively.